#Directions (Q1 to Q40): Read the following information carefully and answers the given questions. Manish is a young and dynamic Company Secretary, has got 65% in the exams, he has experience as Company Secretary in ABC Company Limited; he has excellent communication skills in Hindi and English and also in German. The candidate be appointed as Company Secretary. 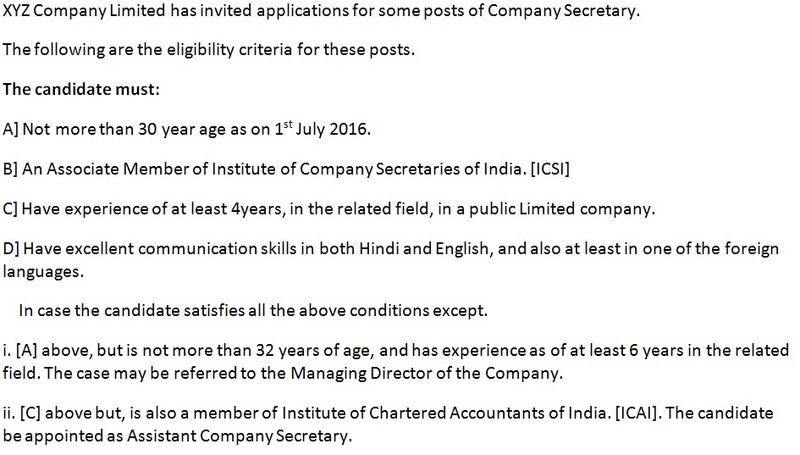 The candidate is not to be appointed as Company Secretary. The case is to be referred to the Managing Director of the company. The candidate be appointed as Assistant Company Secretary. The Data provided is â€˜in adequate to take decisionâ€™. Information regarding age is lacking. Rutwik who born on 18th September 1989, is an Associate Member of ICSI and ICAI, has been working as Chief finance Advisor and Company Secretary in a public limited company in for 5 years. He has excellent communication skills in Hindi and English, He can also speak German and French. Rutwik is appointed as Company Secretary. 26 year old Rekha Joshi, is an Associate member of ICSI. Has been working as Assistant Company Secretary in a public limited company for two years, she is also a qualified Chartered Accountant. She has excellent communication skills in Hindi, English and Japanese. Rekha Joshi is appointed as Asst.Company Secretary. Ram Tripathi is an Associate Member of ICSI, has been working since 1st January 2010, he born on August 15 1984. He has excellent communication skills in Hindi, English and Russian. Case is to be referred to the M.D. Ankur is a Associate Member of ICSI. Has also cleared ICAI, he has been working in a public limited company for 7 years, he born on January 14, 1984, he has good command over Hindi, English and Japanese. Not to be appointed as the candidates age is more than 32 years. Mahesh, who born on 16th July 1997 is a Cricket Player and an all-rounder; he was player of the series in the last Asia Cup Cricket Tourney. He is able to practice from morning 4:00 AM to evening 6:00 PM with only two breaks not exceeding 1 hour each. He has very good conduct. The sports man not to be selected. The case referred to Sports Advisory Board. The Case referred for Fitness test. Data provided is in adequate to take decision. Cricket is not played in Olympics. Seema is a Gymnast, she won bronze medal in the last Commonwealth Games, 18 year old Seema can practice for 10 hours in a day. The candidate be selected for sponsorship. Alok is a Sprinter; He participated in Rio 2016 Olympics, at the age of 18 years. He placed at 4th position, in 100 m track and field running race. He can practice for more than 10 hours in a day. 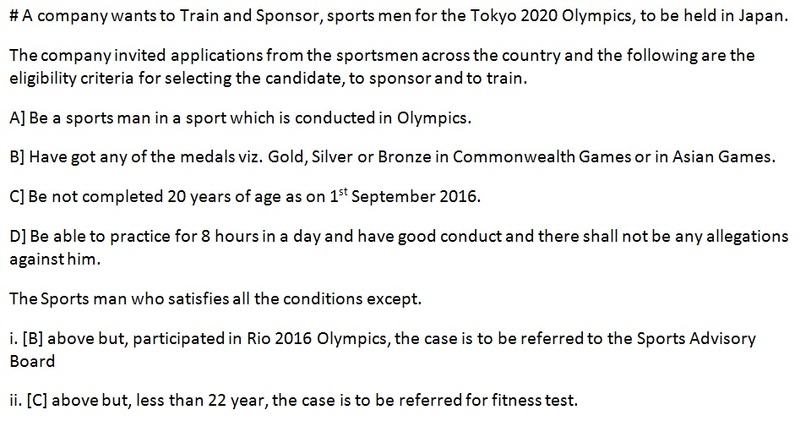 * Alok Participated in Rio Olympics, the case may be referred to Sports Advisory Group. 19 year Tom is a Boxer, he won Silver medal in Commonwealth Games and in Asian Games, with a practice over 12 hours he achieved this medals. He got positive result in a doping test, recently. Srikar is a Weight lifter; he participated in Commonwealth and Asian Games previously. He can practice more than 12 hours in a day, in stood in 5th position in Rio 2016 Olympics, his conduct is good. Data not provided regarding Age.